My time is slowly slipping away, the youngsters are developing and I think this is probably one of the last Championships when I’ll still have a chance to fight for the title. My approach was to try and completely forget about what happened through the first half of the tournament. Approach it like it’s a new tournament. 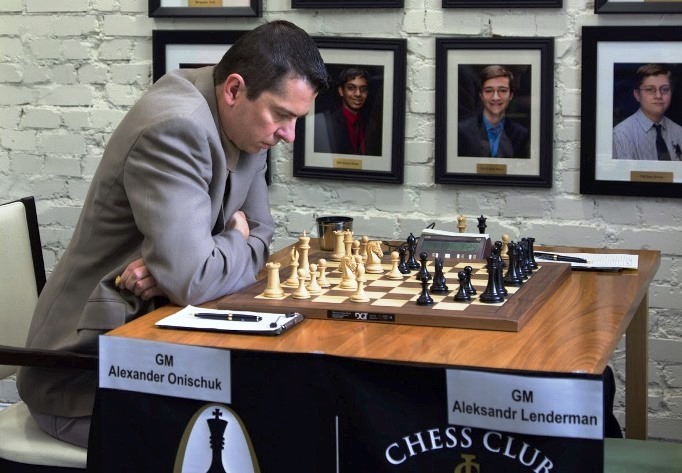 (Onischuk) never loses - but he does sometimes… it could happen, and I figured today he’s going to try and battle against me because I lost two games in a row. He was going to try and pressure me, so I knew I would get more chances than maybe I would normally get; and I was pretty optimistic that if I had a good mindset, then I would have my chances. 1. d4 ♘f6 2. c4 e6 3. ♘f3 d5 4. ♘c3 ♗b4 5. cxd5 exd5 6. ♗g5 h6 7. ♗h4 c5 8. e3 c4 Lenderman plays an aggressive line, not discouraged by his previous losses to Sam and Gata. 9... 0-0 10. ♘d2 ♗e6 11. ♗e2 ♘c6 12. 0-0 ♗e7 This can't be right. Black voluntarily retreats his bishop. Now White has a nice edge. 13. b3 ♖c8? This will likely lose the c4-pawn. 19... ♖xc4! 20. ♘xc4 ♖c8? 21. ♖ac1? A terrible oversight. 21... b5! The tables have turned with a single move! 22. a3 a5! 23. e4? Onischuk clearly did not like the position after 23. axb4 bxc4 followed by 24...axb4, but this is worse! 23... bxc4 24. ♕h3 ♗e6! 25. ♕e3 ♘d3 26. ♖c3 ♕a7 27. ♖dxd3? Losing quickly. A tough day at the office for Onischuk, who almost never loses with White. 27... cxd3 28. ♖xc8+ ♗xc8 29. ♕xd3 ♗a6 30. ♕c3 ♕b6 31. f3 ♕b1+ 32. ♔f2 ♕a2+ 33. ♔g1 a4 34. d5 ♕b3 35. ♕c5 ♕d1+ 36. ♔f2 ♕d2+ 37. ♔g3 g5 38. ♕b6? 38. h3 was best, but I guess Onischuk had had enough. 38... ♕f4+ 39. ♔f2 ♕h4+ Black wins the queen after 40. Ke3 Qe1+ 41. Kd4 Qf2+. 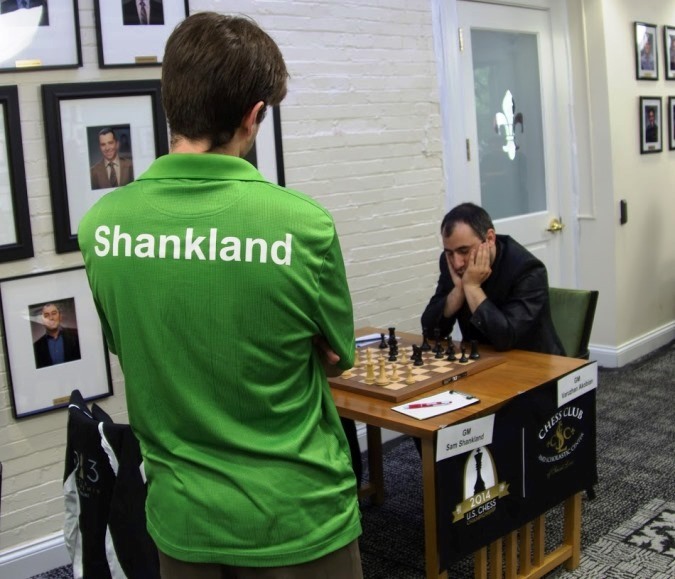 In Round 9 the pressure also got to Akobian, who lost his first game of the event to 22-year-old Sam Shankland, after a Caro-Kann went badly wrong. 20…Be7 was already the sixth (!) time Akobian had moved his dark-squared bishop, and the fifth time in the last six moves. His position is hanging by a thread and he went on to get steamrollered by his young opponent. Akobian pointed out that 7.c3 is not the most challenging theoretically, and it doesn’t have the highest reputation - but I think it’s actually dangerous and I had some new ideas. It’s very sharp and for Black to equalize he has to really know his stuff and play into the sharp stuff, which can be very intimidating if you don’t know it. He played this strange-looking move 10…Bc5, and very quickly I was quite comfortable with my position. That allowed Lenderman to play the move he’s been wanting to play, 48.Ra4! (heading for a7), with tempo, and the threats could no longer be parried. 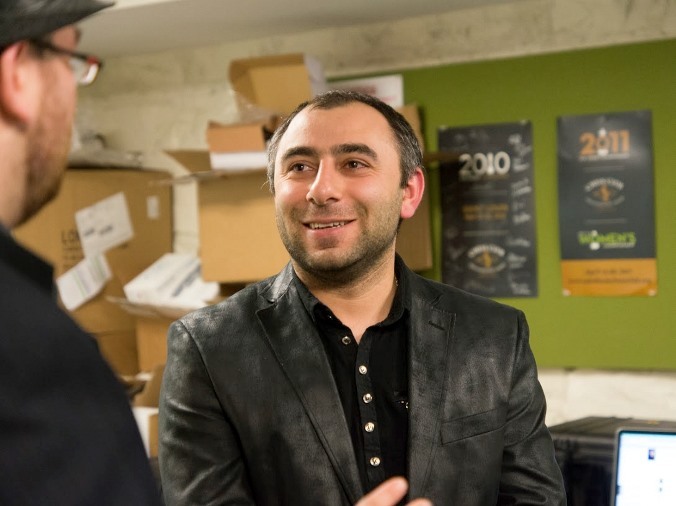 So with two rounds remaining Akobian and Lenderman are locked in the lead on 6/9, though Joshua Friedel (3 wins in his last 4) and Gata Kamsky (2 wins and 7 draws) are lurking only half a point back. 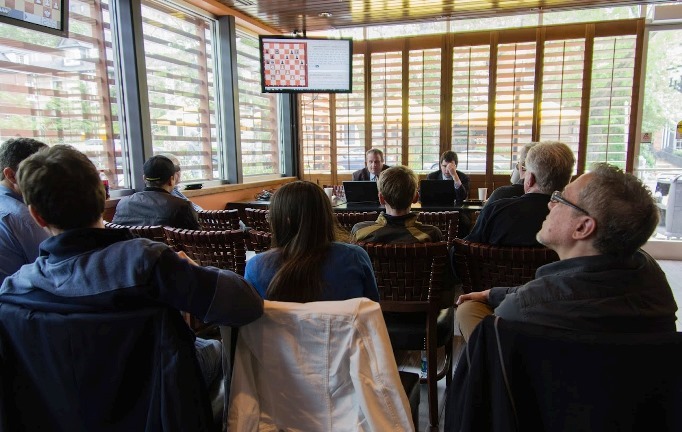 All eyes will be on Akobian-Kamsky in Sunday’s Round 10! 1. c4 ♘f6 2. ♘f3 e6 3. g3 d5 4. ♗g2 c5 5. 0-0 ♘c6 6. d4 dxc4 7. ♕a4 Both players didn't seem to know this line well. Here Black is pretty safe playing 7...Bd7, but played more enterprisingly instead. 10... ♕xd1+ 11. ♕xd1 ♗xc6 as was seen in a game Ulf Andersson was able to draw Kasparov in 1983. 11. ♕xc6+ bxc6 12. ♖xd4 ♘d5 13. ♖xc4 Now White just has a nice edge, and Black has to grovel to try and get a draw. Irina must have been pleased. 13... ♔d7 14. e4 ♘b6 15. ♖c2 f5⁈ Creating more weaknesses can't be a good idea. 16. f3 fxe4 17. fxe4 ♗d6 18. ♗e3 ♖hc8 19. ♘d2 e5 20. ♖d1 ♔e6 21. ♖dc1 ♔d7 22. ♘b3 ♖c7 23. ♘a5 ♖ac8 24. ♔g2 c5 25. ♘b3 ♘a4 26. ♘d2 ♘b6 27. ♘c4 ♘xc4 28. 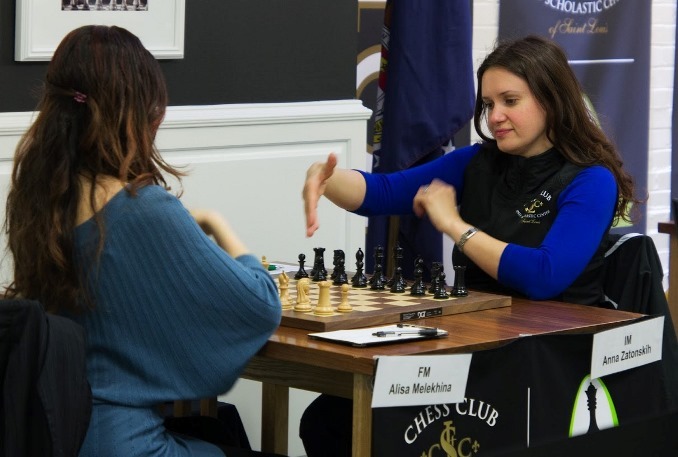 ♖xc4 Black is almost okay here, but there are only two possible results, and Irina keeps pressing against the isolated pawns. 28... ♔e6 29. b3 ♔d7 30. ♖a4 ♔e7 31. ♔f3 ♖f8+ 32. ♔e2 ♖b8 33. ♖a5 ♖bc8 34. ♖c4 ♔e6 35. ♖ca4 c4! 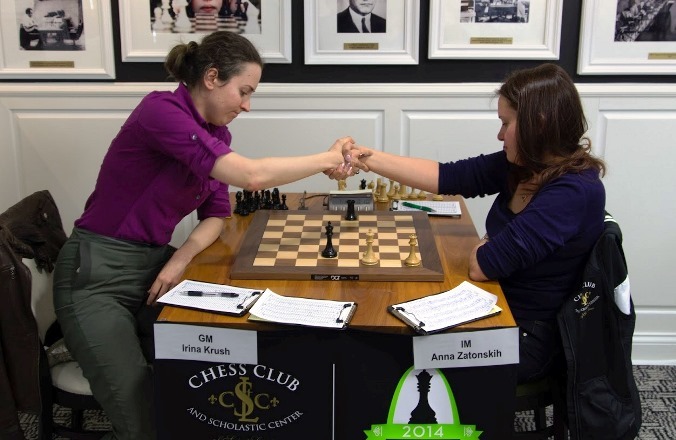 Anna makes the excellent decision to ditch a pawn and try to trade as many pawns as possible. 38. ♖xa7? ♖xe4 39. ♔d3? ♖xe3+ 40. ♔xe3 ♗c5+ and Black wins! 38... ♖b4 39. ♖xa7 h5 40. ♖xg7 ♖b2 41. a4 ♖a2 42. ♖h7 ♖a3+ 43. ♔e2 ♖a2+ 44. ♔f3 ♖a3 45. ♔f2 ♖a2+ 46. ♔f1 ♖a1+ 47. ♔g2 ♖a2+ 48. ♔h3 ♖xa4 49. ♖h6+ ♔d7 50. ♖xh5 ♖xe4 This is about 50-50 whether White will win or draw. Both sides had little time as well! 73... ♔f4 74. g7 ♖a5+ 75. ♔g6 ♖a6+ 76. ♔f7 ♖a7+ 77. ♔e6 ♖xg7 78. h8Q and although White is winning, it isn't easy! 74. ♔h6 ♔g4 75. h8Q A titanic struggle, and now we need to wait until Monday, at the very least (!) to see who wins the U.S. Women's Champs. Needless to say it’s all to play for in the final round on Monday (the women enjoy an extra rest day on Sunday).